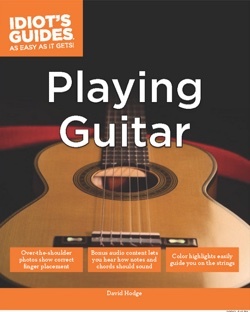 Order Idiot’s Guides: Playing Guitar from Amazon.com today. David Hodge is on faculty at the Berkshire Music School and the author of The Complete Idiot’s Guide to Playing Bass Guitar, The Complete Idiot’s Guide to Playing Rock Guitar, and The Complete Idiot’s Guide to Playing the Ukulele. He is the managing editor and senior columnist at GuitarNoise.com, one of the most popular and highly regarded guitar-instruction websites. I have been wanting a book for sometime that simply puts together the facts about how to play the guitar without a lot of technical information that I cannot understand and this book does it! The book was easy to understand and provides everyone, from new to old with some great basics. Everything from chord progression to tuning and so much more, this book has a bit of everything in it. Let me begin by stating that I have also purchased and read A Complete Idiot’s Guide to Guitar and A Complete Idiot’s Guide to Playing Rock Guitar, both by David Hodge. I’ve been playing the guitar for over ten years now but I’m always on the lookout for books that will add to my musical abilities and, trust me, there are A LOT of books out there that claim to help you learn the guitar. However, Mr. Hodges books are so informative, so engaging, so thoroughly enjoyable that when this latest edition came out, I had to buy it, as well. I don’t consider it all that redundant because the songs and examples have been updated. For any one wishing to learn the guitar and enjoy themselves in the process, this is the book to have. Wondering why there are two different Idiot’s Guides to Guitar? David explains the books differences in in this newsletter from April 2014. Get an idea what this book is like by checking out David’s guitar columns here on Guitar Noise.